Unbelievably July 4th is almost upon us. I often have a family barbecue to celebrate, I love having it, I put up my “stars and stripes” decorations and I just love planning my menu. This year for one reason or another I’m not having my barbecue, a decision I regret but the year has gone by so fast I just wasn’t organised enough. Another decision I regretted was not taking part in this months baketogether, this months recipe is Very Berry Mini Pies and it marks the one year anniversary of baketogether! However as my husband is not the biggest sweet pie fan and I can’t be trusted not to eat all the pie (and it shows!) I decided not to take part. I may seem to be jumping from one subject to another but they end up connected! I got to thinking how it was almost July 4th and I often make a pie of some kind and the baketogether recipe is for mini pies, maybe I could make the recipe “mini” by halving it. That was it, the idea was planted and I had to quickly make these pies before I changed my mind and before June ended, along with the challenge! The next decision was how to change the recipe for baketogether, I never can decide what pie is my favourite, its between cherry, peach or blueberry. For these mini pies I decided on using both cherries and blueberries, which are both plentiful right now. It would be kind of a red, white (the pastry) and blue pie! The results were great! 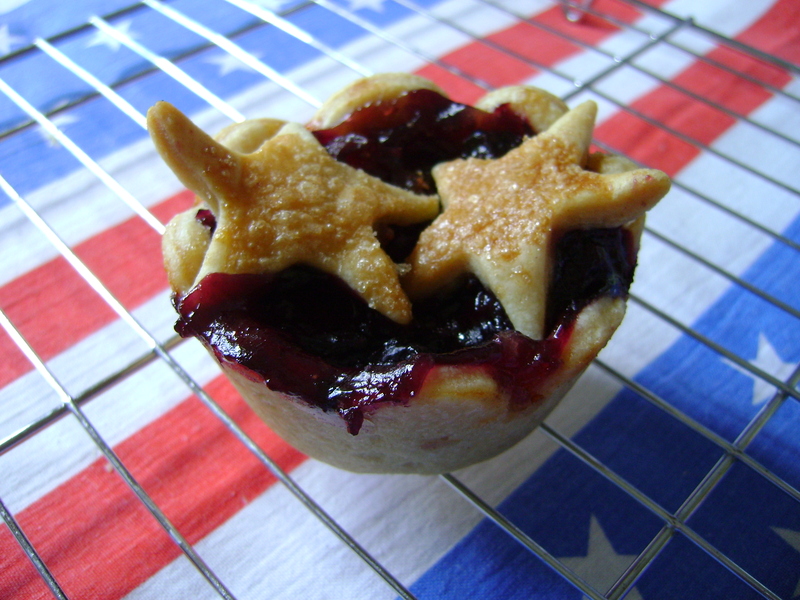 I really like the cherry blueberry combination, I used vanilla sugar and topped the pies with pastry stars as I was short on time, also stars seemed July 4th appropriate. Preheat oven to 190 C, 375 F, Gas 5 and lightly grease a muffin tin. Make the dough following Abbys instructions save some of the dough to roll out and cut 12-14 star shapes for the pie tops. To make the filling mix the flour, sugar and salt together in a bowl. Add half the fruit and using a fork stir into the floured sugar mix, crushing the fruit lightly as you mix. Add the remaining fruit and vanilla if using, mix well. Having lined the muffin tin with the pastry rounds spoon the filling mixture evenly into each pastry lined muffin cup. 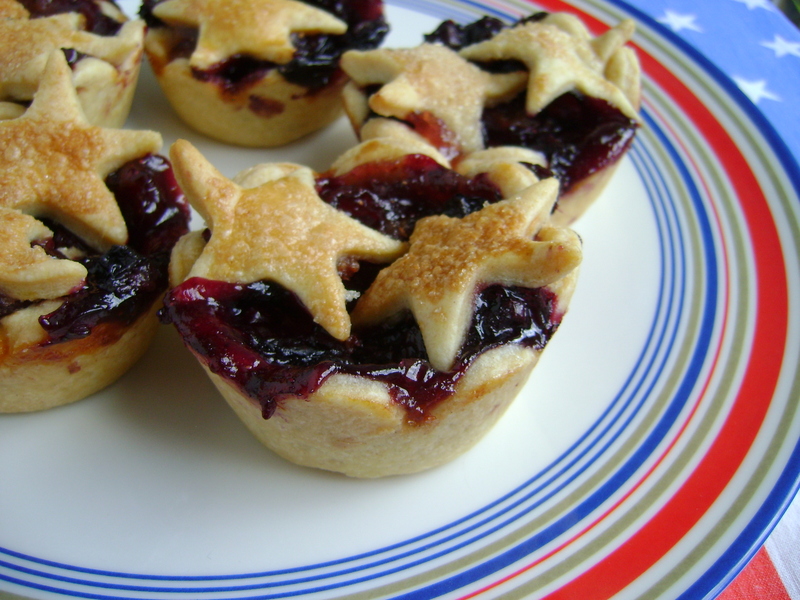 Top each mini pie with 2 stars, brush with milk and sprinkle with sugar. Bake for 25-30 minutes or until the pastry looks golden and the pie filling is bubbling hot. Remove from the oven and run a knife around each pie to loosen from tin, after 20 minutes carefully remove the pies and cool on a cooling rack. This entry was posted on June 30, 2012, 17:19 and is filed under Baketogether, Baking. You can follow any responses to this entry through RSS 2.0. You can leave a response, or trackback from your own site. Oh Jayne, these are adorable! Love the idea of cherries and blueberries together too, just perfect for the 4th 🙂 My Andy will not really celebrate the 4th, but he kind of goes along with it. I love baking with you my friend. Thank you! Love baking with you too! My Andy is happy to eat whatever the celebration!! Jayne, your mini-pies are adorable and so festive! Jayne, these are so gorgeous, I must try and make more sweet pies The combination of fruit sounds wonderful. Happy belated 4th July! Thank you! Sweet pies are the very best kind! Thanks for your comment, mini is cute! Less on the calories too! Thank you! I hope you do get to try them.